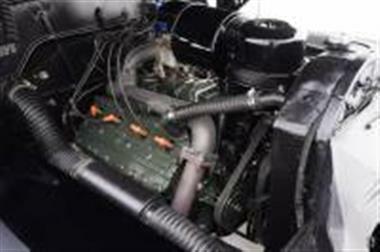 1941 Cadillac Other in St. Louis, MO for sale. 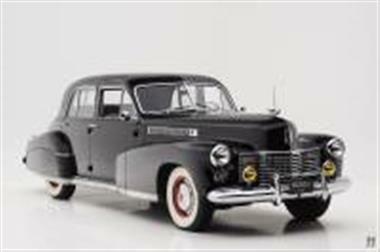 The Bulletin of the CCCA recently identified the 1941 Cadillac as the number one vehicle in ownership among members with emphasis on the rare and distinctive Cadillac Sixty Special. 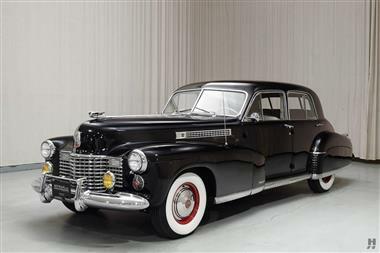 The Sixty Special introduced in 1938 has been called the most influential of all pre-war Cadillac designs – “From every angle the newest car in the world” declared the introduction. The styling is credited to Bill Mitchell selected personally by Harley Earl at the age of 23 to head the Cadillac Styling studio. 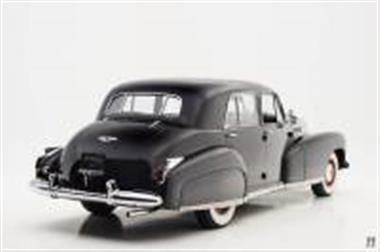 The 1938 Sixty Special was groundbreaking when it was introduced and influenced styling for a generation or more. The body sat within the frame lowering the overall height by three inches without sacrificing headroom. Eimination of running boards allowed for the body to be widened to the full width of the wheel track making the Sixty Special appear even lower. The four-door sedan [the only body style offered] was styled to look like a convertible with slim window frames and wide window openings that forecast the pillarless hardtop convertible style introduced by Cadillac and others in post-war years while the formal roof blended into an extended rear deck. Sixty Specials were bodied by Fleetwood and shared similar premium features and finish with the larger Fleetwood Cadillacs.The Sixty Special has been described as an entirely new kind of automobile for the time; a fast and powerful owner-driven high quality prestige automobile built on a reduced scale and priced within reach of near-luxury buyers. Others have called the Sixty Special the first personal luxury car foreshadowing the four-seat Thunderbird Buick Riviera and others that followed much later. 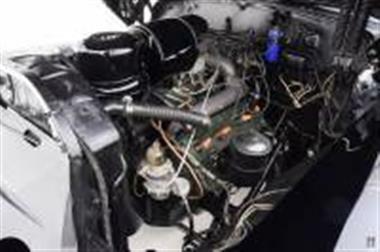 The platform for the Sixty Special was the Cadillac Series 60 chassis and V-8 engine that displaced 346 cubic inches and produced a very strong 150 hp. 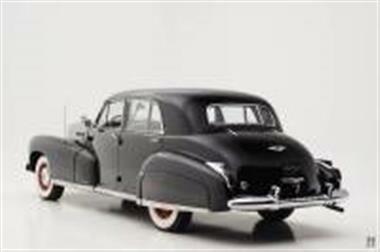 The rigid frame independent front suspension and hydraulic brakes also made for a good handling automobile.The 1941 Cadillac Sixty Special offered here is a very handsome mostly original car which has never had nor required a full restoration. Equipped with the very rare Fleetwood ‘Imperial Divider’ – a glass divider between the driver and passenger making this one of only 220 finished with this feature in 1941 – and is also fitted with the preferred 3-speed manual transmission shifted on the column. The exterior is finished in black with a gray broadcloth interior. 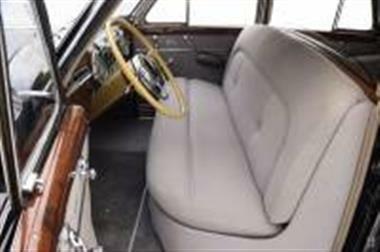 The very stylish Moderne interior features a button and square pattern on the door panels and the lower portion of the front seat back similar to the pattern of the post-war Continental Mark II. The dashboard and window surrounds are finished with a Fleetwood-quality wood-grain paint. 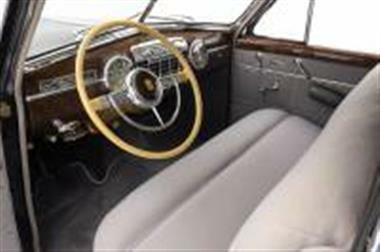 The design of the dashboard also suggests post-war style with two large round faces presenting the speedometer and the clock separated by a bold chrome grille housing the am radio and front speaker. Passengers in the rear relax on a sofa-style seat with unique built-in armrest controls for the radio. The car rides on wide whitewall tires with full wheel covers. The trunk is fully upholstered and carries a single spare.This distinguished Cadillac Sixty Special is not a 100 point show car but is a highly authentic example of a very important pre-war automobile. We offer it here for that buyer who will appreciate the car for its historic significance its special style and beauty and the wonderful potential for touring or simply driving this car.